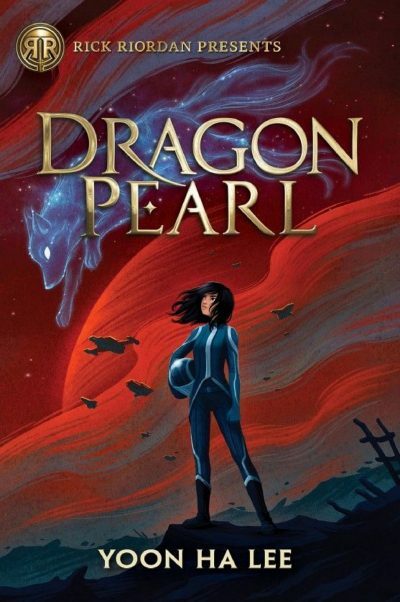 Yoon Ha Lee’s 2019 Dragon Pearl is a standalone science fantasy novel. Thirteen-year-old Min is a magical fox girl. Other supernatural races may be respected throughout the Thousand Worlds, but not foxes. Foxes are seen as untrustworthy and murderous. Min is brought up to conceal her fox nature from neighbours on Jinju. Min is biding her time, waiting to turn fifteen, when she will be eligible to join the Thousand Worlds’ space force. That’s one way off backwater Jinju. She knows even a fox can do this, because her older brother Jun managed it. One day an investigator appears, with bad news about Jun. Jun has vanished, having apparently gone AWOL. What would lead a low-status person to abandon their best hope of becoming a grudgingly tolerated member of society? The lure of treasure. Of the Dragon Pearl. Dragon magic can transform hostile planets into garden worlds. Jinju was supposed to have been properly terraformed, but the shaman who was to have done this vanished centuries ago. The magical Dragon Pearl the shaman held disappeared as well. It’s said that Jun and his companions thought they knew how to find the Pearl and set off to recover it. Convinced her brother isn’t the deserter officials claim, Min sets off to uncover the truth. She uses her talent for charm and shape-shifting to shift through a series of borrowed and false identities. Having narrowly survived a pirate attack, she is rescued by none other than the Pale Lightning, the ship from which Jun went AWOL. Cadet Jang of the Pale Lightning died fighting the pirates. Having received permission from Jang’s ghost, Min dons his appearance and takes his place. Hidden in plain sight, Min can now search for clues to her brother’s disappearance. A trail of clues leads to the Fourth Colony. Having fallen victim to a deadly plague, the Fourth Colony is inhabited solely by the shadows of the dead. The surrounding space is known as the ghost sector. The planet and its vicinity are shunned by all sensible folks. But it seems that Jun has headed there. It is to this world of certain death that Min must go. Science fiction purists may be a bit concerned that fantastic elements like shape-shifting fox girls, dragons, and magical artifacts have somehow infiltrated science fiction, which should deal only in scientifically plausible tropes like biofeedback-mediated form change, FTL, and omnipotent nanotechnology. Such purists would doubtless be appalled at this book, which gleefully mixes tropes from the entire spectrum of speculative fiction. Enjoyably so. Min is an appealing character, who displays teen risk-taking (because death seems so far away, so improbable) coupled with intelligence, cunning, and supernatural talents. Risk-taking guarantees one thrilling adventure after another; the other qualities increases her chances of surviving her adventures. Not that she’s invulnerable, mind you. Foxes are beings of minor power, and shape-shifting can’t heal a blaster wound. Now you may feel that the protagonist of a YA novel must surely have plot immunity. But Lee’s plotting has been shaped by Korean spec-fic, among other sources. Having read a fair bit of Korean spec-fic (novels and comics) I can assure you that plot immunity works a bit differently in that culture. The lead may die and return as a ghost; the narrative will continue without a break1. Will Min survive? The only way to find out is to read the book. Dragon Pearl works well as a standalone. But it’s clearly suited to be the start of a YA adventure series. I’m hoping that the first book will sell well, so that I can read more about Min. The Dragon Pearl is available here (Amazon) and here (Chapters-Indigo). 1: This seems an apropos moment to remind readers that one of the protagonists in Yoon Ha Lee’s The Machineries of Empire series starts off dead. There's no hyperlinks to the online stores.